Dynamics Gymnastics classes in Cambridge, give gymnasts the opportunity to experience General Gymnastics. General Gymnastics is a British Gymnastics discipline that encourages gymnasts to learn a variety of low level skills from other British Gymnastics disciplines such as Artistic Gymnastics, Acrobatic Gymnastics, Trampoline Gymnastics and Rhythmic Gymnastics. 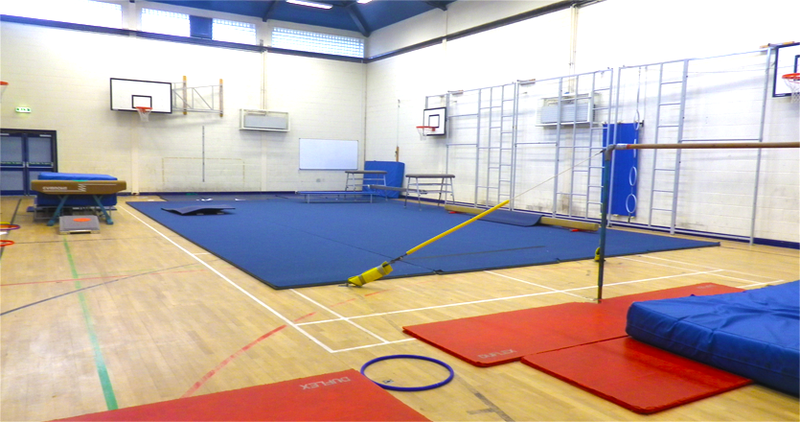 At Cambridge we have access to a 12m x 8m floor area, a Vault, a trampette, asymmetric bar, benches, 2 trampolines, a full size floor beam and fixed wall bar apparatus with beam, ladder and bar attachments. During the classes, gymnasts progress towards achieving badges 8 – 1 of the British Gymnastics Proficiency Award Scheme followed by the Dynamics Gymnastics Award Scheme. 6 – 8pm: Experienced gymnasts who are working on the Dynamics Gymnastics Award Scheme. Please be aware entry to this class is by invitation only as a progression from our 1 hour classes. The classes are at the Parkside Community College gymnasium in the centre of Cambridge. Parkside Community College can be found on Parkside which runs alongside Parker’s Piece. It is approximately 150m beyond the police station on the right had side. Two large blue gates mark the entrance. During class times, parking is usually available in the front playground and the gym is the building to the right as you enter the playground. Please note, however, that the barrier to the front car park is typically not lowered by school staff until 5pm on weekdays. Before this time, access to the back car park is via Prospect Row and parking here is available just while you drop gymnasts off at the class. In addition to this, the car parks can get very busy particularly when there is a school event at the same time as our classes. Although we try to warn parents of such events, we are unable to guarantee advising you in advance and recommend that you always allow plenty of time should you opt to try and park at the school.